This is my new favorite appetizer or side dish. It tastes like you are eating a piece of pizza without the bread. I love, love, love it! This is one of those recipes that you don't need to have specific amounts of ingredients. 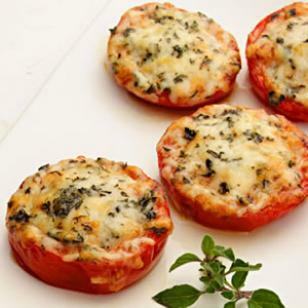 Slice the tomatoes into thick slices, like you would for a hamburger. Sprinkle with some salt. Sprinkle with some ground oregano. I prefer quite a bit. Top with some Parmesan cheese and then drizzle a little bit of olive oil on top. Bake at 450 degrees for about 10 minutes.